1976 There is no theory of petit bourgeois politics. Debate. Review of African Political Economy, 6, 84-89. 1985 Marketing without and with marketing boards: the origins of state marketing boards in Nigeria. 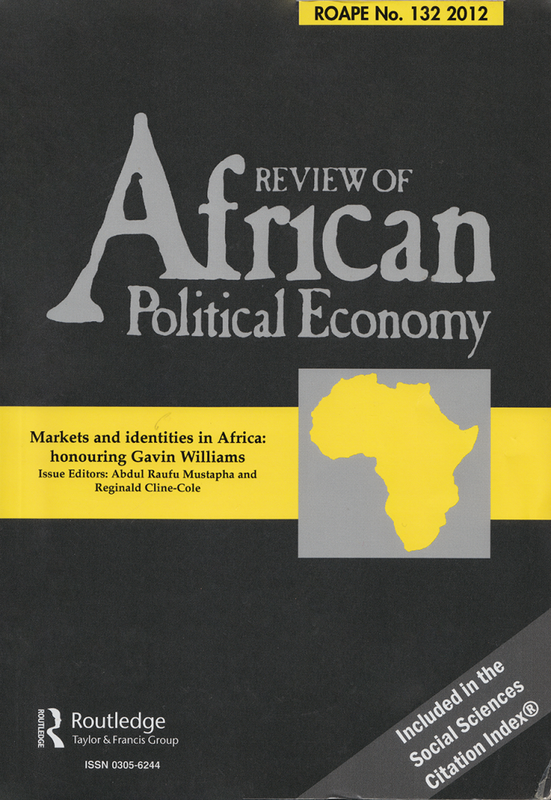 Review Of African Political Economy 34, pp. 4-15. 1988 The World Bank revisited: a review of the World Bank’s Nigeria: Agricultural sector reviews. Review Of African Political Economy 43, 42-67. 2004 Political economies, democratic citizenship and African studies. Review of African Political Economy, 102, pp. 567-579. 1987 Lionel Cliffe, Pepe Roberts, Alfred Zack-Williams and Gavin Williams. ‘News and Notes’. Polish-Soviet Conference on African Development, 117-119. 2000 Review of Doctrines of Development, by M.P. Cowen and R.W. Shenton, Routledge 1996. Abdul Raufu Mustapha, Reginald Cline-Cole and Gary Littlejohn, Raufu Mustapha, Markets and identities in Africa: honouring Gavin Williams, 209-212. Anne Pitcher, Was privatisation necessary and did it work? The case of South Africa, 234-260. Timothy Sizwe Phakati, Worker agency in colonial, apartheid and post-apartheid gold mining work, 279-294. Kathryn Nwajiaku, The political economy of oil and rebellion in Nigeria’s Niger Delta, 295-314.